Rodolfo's artwork incorporates printmaking, hand-blown glass, ceramics, mixed media sculpture, and performance, and explores the relationship of the body to industrial forms and social norms. 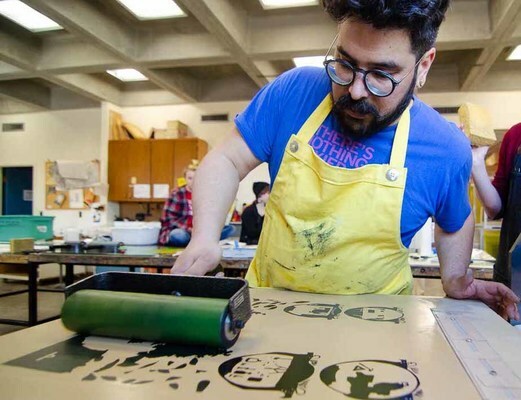 Originally from southern California, Rodolfo received an MFA in Printmaking with a minor in Ceramics at the University of Iowa in 2012, and a BFA in Printmaking from California State University, Chico in 2007. International and national exhibitions have featured Rodolfo’s artwork, at venues such as the Liu Haisu Art Museum, Shanghai, China; the Milwaukee Institute of Art & Design, University of Wisconsin, Milwaukee, WI; the Janet Turner Print Museum, Chico, CA; Pacific Lutheran University, Tacoma, WA; the Quad City Art Center, Rock Island, IL; the Sioux City Conservatory of Music, Sioux City, IA; the Green Building Gallery, Louisville, KY; and the City Gallery, Lexington, KY.
Rodolfo is Cofounder and Executive Director of Calliope Arts, a collaborative printmaking workspace in Louisville, KY. In 2017 and 2018, he was a Visual Arts faculty member at Kentucky's Governor's School for the Arts, a summer arts intensive for high school students. Recent artist residencies include Kunstnarhuset Messen, Alvik, Norway; Kala Art Institute, Berkeley, CA; and Edinburgh Printmakers, Edinburgh, Scotland. In summer 2019, Rodolfo will lead a collaborative, interdisciplinary session at Mildred's Lane, a 94-acre installation and research space in Beach Lake, PA created by J Morgan Puett and Mark Dion.